Which is the correct pronunciation of Han in Star Wars? The release of "The Force Awakens" reminded me of something I found confusing in both the older and newest Star Wars movies -- the pronunciation of Han Solo's first name. It seems that some characters pronounce Han like you'd pronounce the first part of the word Hand. Others pronounce it like the first part of the country Honduras. I don't remember hearing him say his own name (though he probably did at some point) so I'm unclear on this. George Lucas, the creator of Star Wars clearly thinks that it's Han with a hard 'a' (rhymes with "hand"). It's not entirely clear why every other character mispronounces it throughout the film series. 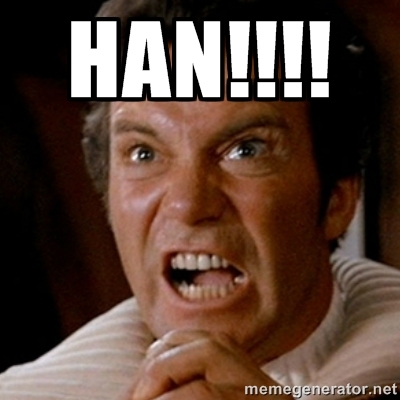 Han is pronounced with a soft "a". Like "Hahn" (rhymes with "con"), as opposed to "Hann" (rhymes with "Ann"). Not the answer you're looking for? Browse other questions tagged character star-wars .